With a single license you can use Mailster on one site per license. If you like to use your license on a different domain and move all the data from Site A to Site B you have to follow some steps. Please not you can only reset your license for a limited time. Please read more on the License Information page. You should backup both databases before doing any importing or exporting on your site. You can find several backup plugins on the WordPress repo. You have to deactivate your license to make it available for other sites. 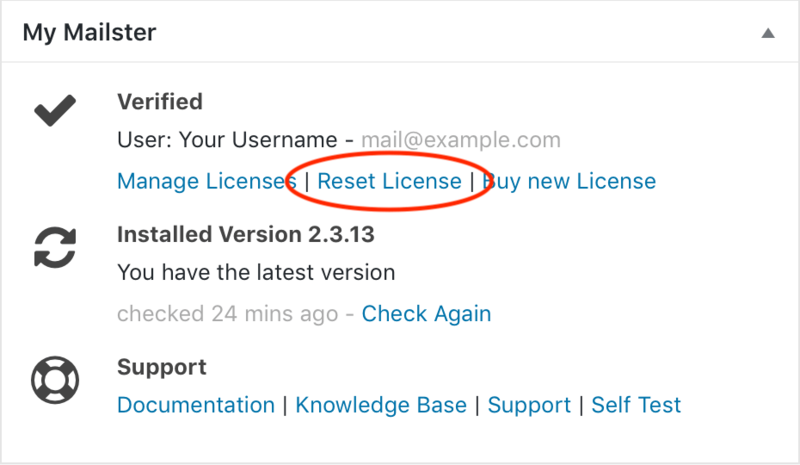 On Site A find the “Reset License” link on the Mailster Dashboard. Once you reset your license you can no longer update Mailster on Site A and you have to re validate your site again. Now you need to access your database from Site A and copy all tables starting with wp_mailster_ to Site B. Get in touch with your provider if you don’t know how to access your database. Head over to Site B and install Mailster. Follow this guide if you have troubles. Once the Mailster tables are copied go back to Site A and export your campaigns. Since Mailster uses a custom post type for the campaigns you use the regular export tool from WordPress wich can be found at Tools => Export. Best is to just export “Campaigns” so you don’t get to much data in your export file. Similar to the export you can now import the campaigns on Site B. Go To Tools => Import and choose the WordPress Importer. Mailster will check the ID’s of the campaigns if they have changed and remap them automatically.